A fragment of bone from a Devon cave may hint at cannibalism by early Britons, according to archaeologists. Researchers say the 9,000-year-old bone carries cut marks made by a stone tool which are consistent with the act of dismemberment. Scientists believe the bone is evidence that Britons from the Mesolithic period engaged in complex burial rituals and possibly cannibalism. Human remains from this period are extremely rare in Britain. 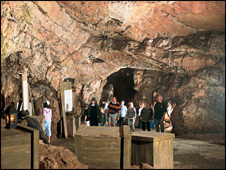 The bone was found at Kents Cavern in the late 19th century and was being stored at Torquay museum where curator Barry Chandler noticed the cut marks on it. He showed the bone to Dr Rick Schulting from Oxford University who concluded that it belonged a human adult. Dr Schulting told BBC News: "The cuts are along the top of the ulna, the top of the bone of the lower arm, right at the elbow. They look like they're made by stone tools rather than metal tools." "They're just a series of fine parallel cuts as though you're trying to dismember, to remove the lower arm." "The person must have been already dead at this time. So you're looking at post-mortem dismemberment for some reason." Dr Schulting says the marks could be evidence of a complex mortuary treatment. Or, he says, "the other possibility is that this is done for quite another reason, the consumption of the individual as part of cannibalism." The bone is also fractured and according to scientists this probably happened when it was still fresh, which might provide some support for the cannibalism theory - but Dr Schulting urges caution. Carbon dating put the bone in the Mesolithic period, between the end of the last Ice Age and the start of farming. Dr Schulting hopes to resolve the cannibalism question by searching Kents Cavern for other human and animal bones remains from this period to see if they were treated in the same way. Dr Silvia Bello, a palaeontologist at London's Natural History Museum, told BBC News: "Cannibalism amongst [Homo] sapiens and pre-sapiens humans has always been a taboo topic. Whilst the presence of cut marks on faunal remains is usually referred to as a direct manifestation of butchery activities, cut marks on human remains are not usually considered to be un-equivocal evidence of cannibalism. "The presence of butchery cut marks on human remains is generally interpreted as ritual practice, such as de-fleshing, scalping, dismembering, without consumption of the body. However, although difficult to prove, cannibalistic practices cannot be completely dismissed." "The newly described human remains from Kent's Cavern are clearly an important development in the reconstruction of the complex funerary behaviour of Mesolithic people in Britain." In the UK, the only other bones with cut marks were discovered in Gough's Cave, Somerset and are 5,000 years older. This bone was dug up by in 1866 by archaeologist and geologist William Pengelly. He discovered it in the upper levels of Kents Cavern which are less studied than the lower levels as the items here are generally more recent. It was being stored alongside some fragments of animal bone from the same area when Barry Chandler spotted it. He was surprised that the carbon dating showed it as being so much older than the rest of the collection which are from the Bronze Age or late Neolithic era.